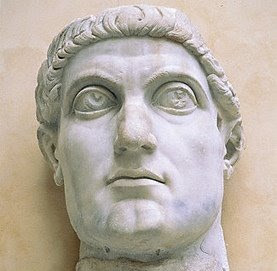 Some scholars who read The Oration of Constantine are in utter disbelief that he could have have ever written and proclaimed publicly such a well-articulated confession of faith and been so utterly converted from paganism that he absorbed the loftiness of the Christian message. The truth of the matter is that there is no reason to disbelieve what the Church already knew about one of its greatest and most misunderstood Saints, who has been scapegoated as the source of every error in Christendom. Below is a chapter from his Oration that I especially love because it shows the utter depth of his humility by distinguishing all created things from Him who alone is uncreated, and it reveals the depth of his spiritual stature in his ability to clearly teach how created mortals as ourselves can be partakers of the glory of God. This revolutionary proclamation transformed the Roman Empire for centuries until its demise over a thousand years later and became the focal point of everything the Roman Empire tried to stand for all those years. No longer would an emperor be a god on earth and no longer would the citizens of its empire be subject to the fears and passion-filled rituals inflicted upon them as pagans. What is written below is the essence of what every true Roman/Byzantine was to aspire to be. Surely it must be the very height of folly to compare created with eternal things, which latter have neither beginning nor end, while the former, having been originated and called into being, and having received a commencement of their existence at some definite time, must consequently, of necessity have an end. How then can things which have thus been made, bear comparison with Him who has ordained their being? Were this the case, the power to command their existence could not rightly be attributed to Him. Nor can celestial things be compared to Him, any more than the material with the intellectual world, or copies with the models from which they are formed. Nay, is it not absurd thus to confound all things, and to obscure the honor of God by comparing him with men, or even with beasts? And is it not characteristic of madmen, utterly estranged from a life of sobriety and virtue, to affect a power equivalent to that of God? If indeed we in any sense aspire to blessedness like that of God, our duty is to lead a life according to His commandments: so shall we, having finished a course consistent with the laws which he has prescribed, dwell for ever superior to the power of fate, in eternal and undecaying mansions. For the only power in man which can be elevated to a comparison with that of God, is sincere and guileless service and devotion of heart to Himself, with the contemplation and study of whatever pleases Him, the raising our affections above the things of earth, and directing our thoughts, as far as we may, to high and heavenly objects: for from such endeavors, it is said, a victory accrues to us more valuable than many blessings. The cause, then, of that difference which subsists, as regards the inequality both of dignity and power in created beings, is such as I have described. In this the wise acquiesce with abundant thankfulness and joy: while those who are dissatisfied, display their own folly, and their arrogance will reap its due reward. Excerpt from The Oration of Constantine, Chapter XIV.